Another tour de force for Helwig. I'm so glad I discovered this author last year, through Porcupine's Quill Press and with the incentive of the 1st Canadian Book Challenge. Now I'm back for the CBC II with this full-length novel set in PEI. 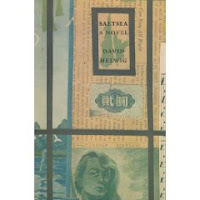 This novel is a type I am particularly fond of: it takes a location, here the specific house which becomes the hotel Saltsea, and traces the lives of those who pass through it. Of course, this kind of story could go on forever, so the events of the novel are limited to a few weeks of a summer pretty much in our present. People arrive at the hotel, small things happen, relationships are formed and/or dissolved, people leave the hotel -- and more people arrive, whose stories we'll never hear. In the last few pages of the novel, all of the people we've been following are leaving, the story is changing, and into this comes an observant little girl, Eleanor. She's come with her family, her parents and two little sisters Helena and Melanie. She looks at some of the things left behind by the departing guests and interprets them completely differently than those who'd left them behind; I loved this about the story. Many of the characters are shown viewing the same occurrence and coming to completely different conclusions, and Helwig lets this be. He doesn't try to explain which is the REAL reason behind something, the point is that everyone sees something different in every moment. While reading this, I was reminded of Vonnegut's comment on fiction: "The plot is just a bribe." While there is a plot in this novel, it serves to propel the story to a moment of closure but is not the purpose of the telling. The reward in reading this comes from savouring the specificity of a butterfly clinging to a stalk of grass with tiny feet, or feeling yourself in the hotel on a rainy night entertaining one another with music and recitations. It comes from recognizing how strange and lonely/alone every human being is, and how our relationships result from our need for connection. Robin was cycling home in the dark... She had a lamp on the front of her bike, and she knew the way, but still the darkness was very large and her bit of illumination crossing it was very small...the brightness of the stars made her aware of the huge cold spaces that surrounded her, made her breathe deeply and and listen to the sound of her wheels on the pavement. You could vanish into that great night of space, an image fading to black, a hint that romance and horror may lie behind any moment of time, or so the movies believe. They have no love for the quotidian, the tiny blessings. Birdsong, wind: here by the ocean every noise was surrounded by silence that reached all the way to the stars. Monica studied the white shingled building above the slope of green lawn, deep bays rising two storeys on each side of the front door and the windowed porch. You felt the big rambling construction must have a memory, old thoughts. Listen, I am the voice of what once was. I am as real as the beating of your hungry heart. The life he lived here was outside of history. Saltsea was a place for contemplation, where men and women indulged themselves in the slowness of pleasure, like the mandarin in his garden, thoughts moving in the measured strokes of a fine calligraphy. At worst, pinchbeck paradise. Perhaps leisure allowed a man or woman to grow aware of the specific gravity of the personality -- a high flown phrase, but all the same, when you put it that way, you saw that there was a point to their work, that clean laundry, even, had its justification, its meaning. There are a few characters I dislike, but not because of any flaws in their realization, rather because they are so real, and so disagreeable. I am impressed by Helwig's ability to create a story so fascinating out of not much at all. Most of the shocking action takes place off-stage, so to speak, in memory and recollection, although the younger characters do get up to some of their own particular memory-making. It's a book to read while on vacation, or even as a vacation; the narrative voice is slow and deliberate and it takes some time to get to know all the players. The rewards are well worth the effort, though. This book has started off my year of Canadian Book Challenging on a high note.